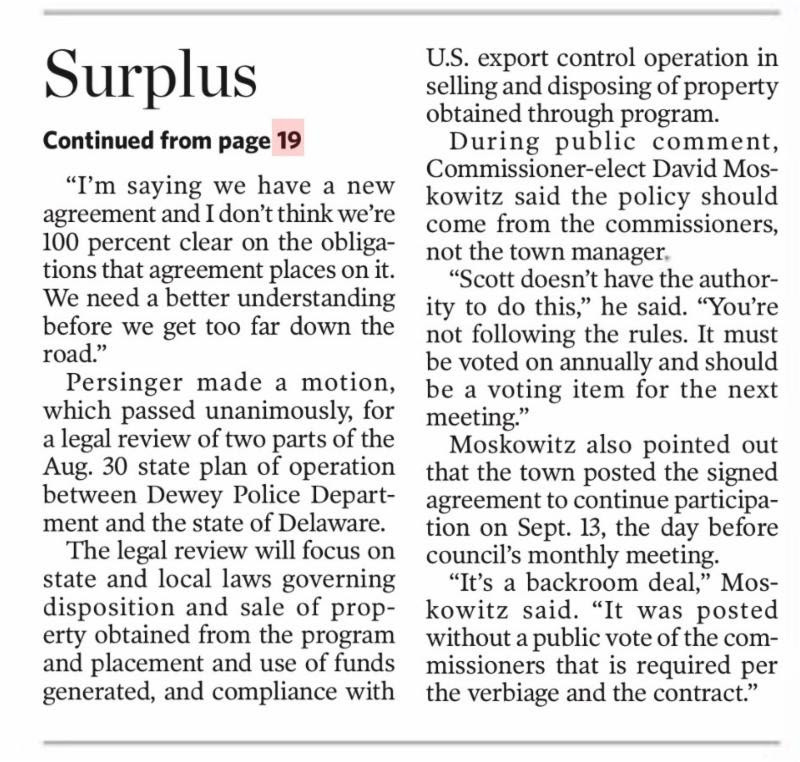 The issue in the Gazette today (below) speaks loudly and follows up on our one week ago email of September 14 to all residents on this subject of unauthorized signing, and failure to disclose a last minute pre-election effort by the Town Manager and Police Chief to extend the Military Surplus program without prior Town Council approval. Along with the residents already involved in this issue, and support from some members of the Council, we need you to sign the below petition to the Attorney General who has asked for a reply from interested parties. That would be the entire town. As a town we cannot have documents wrongly signed and hidden without proper Council vote or citizen input. Please click to sign the Petition to the Attorney General today. "We the undersigned citizens and residents of Dewey Beach, urge the Delaware Attorney General to allow proper Dewey Beach Town Council and resident/citizen input into the August 30, 2018 contract signed only by the Town Manager and the Police Chief dealing with the acquisition of Military Equipment. The document itself says it requires “governing body authority…by... City Council” in section E-1. The town was in the process of discussing the issue, when we found out on September 13 and 14 (two weeks after it was signed, and the day before the election) that the document even existed and was already already approved. Please take action to put this document on hold until, as stated by Dewey Town Council on September 14, it can obtain proper legal review."